2 − = one Required Please enter the correct value. The market was disappointed with Friday's employment data. But actual total employment, as opposed to the widely reported seasonally adjusted numbers, was nowhere near the catastrophe that the market's reaction made it seem. The problem was that economists' expectations were misguided, partly as a result of their focus on seasonally adjusted fictitious data which in recent months had appeared to be on a solid uptrend. On Friday, the market was surprised when payrolls showed a seasonally adjusted gain of 54,000 for May. Economists, looking in their one-way rear view mirror, had expected 125,000, which was after adjusting down when they saw the lousy report on private payrolls from ADP. Their prior estimates were even wider of the mark. Fortunately for them, their pay does not depend on their being right. Had the market and economists been paying attention to the real trends in the actual, not seasonally manipulated data, they would not have been shocked by the number. 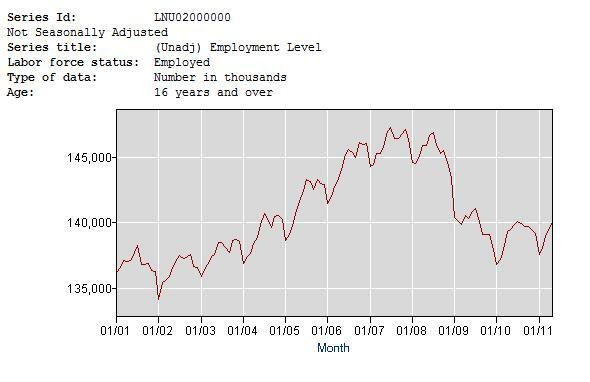 Actual (not-seasonally-adjusted) payrolls were up 682,000, according to the BLS establishment survey. That's certainly not gangbusters in relation to other years, but it's not that bad, and it's completely consistent with the trend of recent months. Since 2001, the average gain in payrolls in May has been 764,000. 2010 had a very strong gain of 1.10 million. That number was an outlier due to Census Bureah hiring. The best year before that was 2007 at 942,000. Friday's reported numbers were certainly worse than non-recession years, however. Only 2008 at 570,000 and 2009 at 269,000 were worse. These numbers were a little better than that, but certainly not competitive with strong growth years. In addition to the establishment survey, the BLS also surveys households. 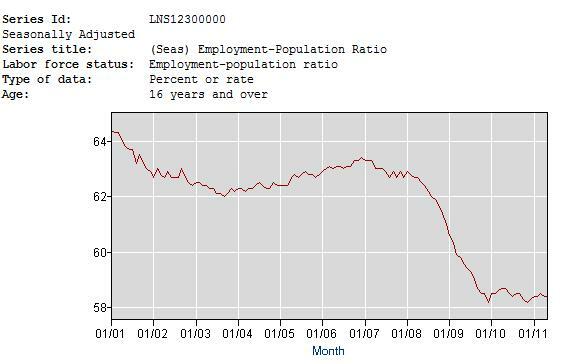 The total number of employed persons (actual, not seasonally adjusted) according to the BLS household survey rose by 367,000. 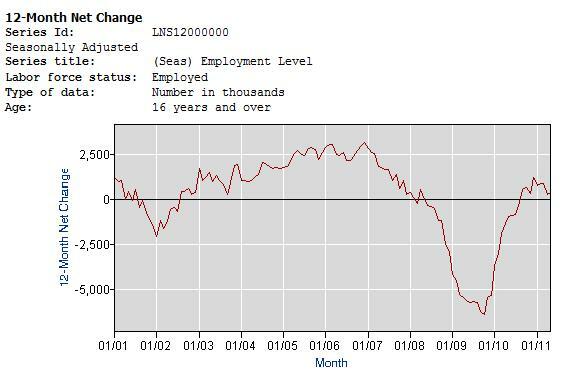 The average gain in total employed in May from 2001 to 2010 was 344,000. From this perspective, Friday's number was a little better than average. But digging deeper into the data reveals that growth momentum is slowing. Apparently, professional economists weren't paying attention. The histrionics surrounding today's announcement are an artifact of the fact that many economists had assumed without good reason that the numbers would be much better. However, the unadjusted actual numbers in the household survey had shown a decline in growth momentum since the end of last year, and Friday's data simply continued that trend. The slowing employment growth momentum this year has been concurrent with the decline in stimulus spending that spurred the employment gains in the first place. In that context, slowing employment growth should have surprised no one. Total employment usually peaks in July. Therefore, we should find out just how weak the employment trend is over the next couple of months. The question is whether last year's peak employment numbers will be broken, and if so, by how much. The first few months of seasonal decline in the second half could show a shift to negative momentum if the usual second half employment declines are greater than last year's. Even if total employment grows slightly year over year, if the growth is less than population growth, the employment-to-population ratio will continue to fall. The economy might grow in nominal terms but life will get harder for a growing number of Americans. If you believe, as I do, that the employment growth of the past year was all due to government stimulus spending and Fed money printing, then you might conclude that jobs will disappear more rapidly than usual in the second half of the year. So while the current numbers were consistent with the recent trend and should not have been surprising, if you look ahead, there's every reason to believe that they will get worse. The Wall Street chief economist shills, as usual, are behind the eight-ball. They have some catching up to do. This is a perfect example of why the market isn't a discounting mechanism–it's a rear view mirror driver. By the time The Street gets around to recognizing and admitting what's really going on, it will, once again, be too late for you. If you want to get into the pits with these charlatans, you'd better have your eyes open, and pay attention to the details– the real numbers, not the seasonally manipulated dreck. An earlier, sanitized, version of this article appeared at Marketwatch. The current version of this piece is from The Wall Street Examiner. Stay up to date with the machinations of the Fed, Treasury, Primary Dealers and foreign central banks in the US market, along with regular updates of the US housing market, in the Fed Report in the Professional Edition, Money Liquidity, and Real Estate Package. Try it risk free for 30 days. Don't miss another day. Get the research and analysis you need to understand these critical forces. Be prepared. Stay ahead of the herd. Click this link and begin your risk free trial NOW!